Whiskey Live Dublin always throws up a surprise or two. This years was the safely guarded release of Whiskey 21C. This is a unique historical bottling of all the Irish Whiskey Distilleries that currently have stocks of matured whiskey in their possession. The Celtic Whiskey Shop – not content with being the hard working organisers behind Whiskey Live Dublin – contacted all the distilleries with matured whiskey – asked for a donation of some of that precious liquid – proceeded to blend it – bottle it – sell it at the show on a strictly limited never to be repeated release – all for the Downs Syndrome Ireland charity! Now that WAS a surprise indeed! Bushmills Distillery – Producers of the Bushmills range + other brands. Cooley Distillery – Producers of the Tyrconnell, Connemara, Locke’s & Kilbeggan ranges – as well as numerous other brands. Echlinville Distillery – All current releases under the Dunvilles brand are sourced – yet Echlinville are sitting on 5 year old whiskey of their own making which has not yet been deemed ready for it’s public debut. Great Northern Distillery – Producers of the First Born range debuted at Whiskey Live Dublin. Kilbeggan Distillery – Producers of Kilbeggan Rye – the 1st Irish Whiskey containing rye for many a year and the 1st whiskey to be wholly produced at Kilbeggan since the micro distillery was commissioned there in 2010. Pearse Lyons Distillery – Producers of Pearse 5 Year Old Single Malt. Some of the Pearse blends also contain malt made on the stills sited at the Pearse Lyons Distillery in Dublin. Teeling Whiskey Co – Producers of Teeling Single Pot Still. All other current releases are sourced. The Shed Distillery – Producers of Gunpowder Gin & Sausage Tree Vodka – yet clearly have whiskey waiting to be released. Tullamore DEW – All current Tullamore DEW is sourced – yet they are obviously sitting on whiskey which has been produced at the new Tullamore Distillery. West Cork Distillers – Producers of the Glengarriff range. Some of the WCD range is sourced + they supply other brands too. Camera Shy Cork Distillery – The only whiskey producer not mentioned is Midleton. Could this be them? A small sample of Whiskey 21C was also offered to Whiskey Live Dublin attendees! I found it a young, fresh & fruity blend. Approachable & easy despite it’s 54.2% strength. There was no mention if it was either a blended malt or a malt & grain mix – nor the percentages of the distilleries involved in the project. I was just extremely pleased to get a chance to taste the future of Irish Whiskey! A big thank you to all the hard work of the team behind Whiskey Live Dublin AND Whiskey 21C. May your glass be ever full! The first thing you notice about the new Flintlock release from the award winning Chapel Gate Whiskey is the pale complexion of the 16 year old single malt. The next thing you notice is the rich aroma of vanilla even as you pour the sample into a Túath Glass. It’s silky smooth in the mouth. Yet more rich vanilla & light caramel from the bourbon cask maturation. Some fresh lemony citrus notes. It softly grows into a gorgeously gentle spiciness which dances off the tongue. A lovely warming finish rounds up this award winning single malt. A sample was taken at the Irish Whiskey Awards held in Slane Castle on 18th October 2018 and tasted at home. Limited release – contact Celtic Whiskey Shop to reserve a bottle. If you’re looking for some novelty whiskey then the Celtic Whiskey Shop is the place to go. They have a range of miniature bottles labelled up in county colours covering the entire Island of Ireland. Meanwhile, I happened to be in Mullingar recently & picked up their Westmeath Irish Whiskey in the surprisingly well stocked off-licence of The Old Stand on Dominick Street – just round the corner from the railway station. Not being one to leave a bottle unopened – I poured a glass. There is no indication as to the source of the whiskey. Kilbeggan Distillery does produce malt in the county of Westmeath – mainly for inclusion in blends – but it didn’t strike me as one of theirs -although this young lad is definitely from Mullingar. The colour was reassuringly straw like – even if added caramel is predominant in entry level blends. The nose was rather spirity at first – but calmed down on subsequent tastings to reveal some standard vanilla & caramel notes. A mild tasting with subtle fruits & more of that bourbon cask influence made it’s presence felt after a rather alcohol forward mouthfeel. There was a bit of a burn at the end – but nothing too unpleasant. Just a straight forward no-nonsense entry level whiskey. My thanks to TOMODERA for posting his thoughts on other county whiskeys here. One of the highlights of my whiskey year is being able to participate in the annual Irish Whiskey Awards blind tasting sessions. There are no labels, no brands and no preconceived ideas of what particular expressions you like. Just row upon row of identical bottles filled with varying colours of the brown stuff for you to sample & score. The only markings are the codes to donate which category the whiskey is in and it’s number. I managed to make 2 out of the 3 judging sessions that were held in Dublin back in late August, early September. Only after the Awards Ceremony itself in October are the names of the actual expressions revealed – and it has thrown up some interesting results! Confession No 1. I’m not a trained whiskey taster. 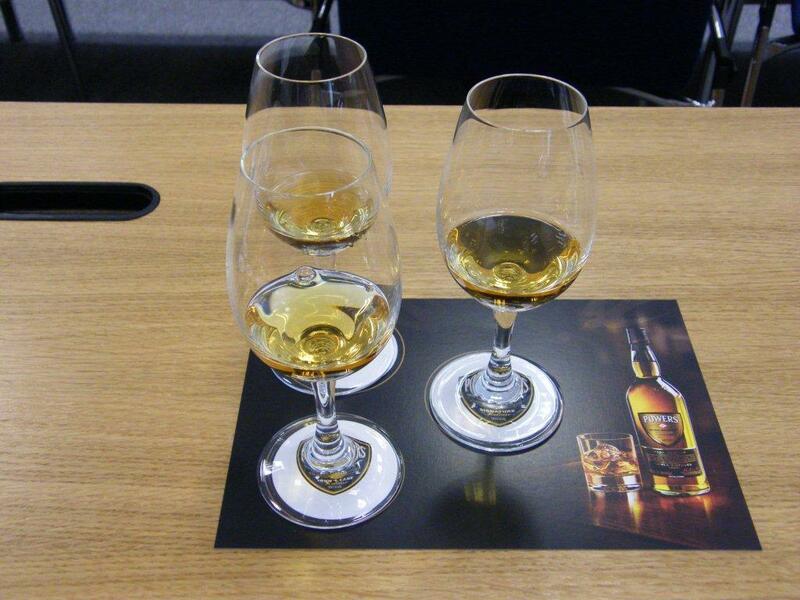 Simply by being a member of the Celtic Whiskey Club or Irish Whiskey Society you get an invite to the sessions. By taking part you very quickly learn to spot which expressions you enjoy – or those that you enjoy less – and mark them accordingly. Whiskey tasting for me is very subjective. It’s about what I like and enjoy. I’m not judging to spot a winner or to stock a bar – it’s just down to me and my palate. Now the only ‘control’ at the session is a gentleman who happens to score diametrically opposite to me – his top scorers are my bottom markers, and vice versa. This pattern has remained consistent for the last 3 years. Which is reassuring. 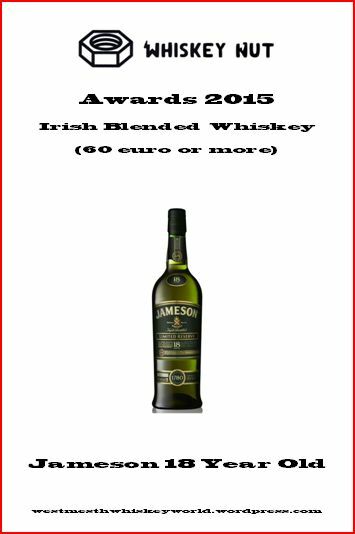 The first days judging consisted of Irish Blended Whiskey under 60 euro and blends 60 euro plus. It proved to be a very packed field. Confession No 2. Despite only sipping a small sample, using the spittoon & drinking copious water in-between – I got rather tipsy towards the end. The session ended up being a bit of a ‘speed tasting’ event simply to get through all of the whiskey! I did recover after however with a hearty meal & a calming cup of tea. 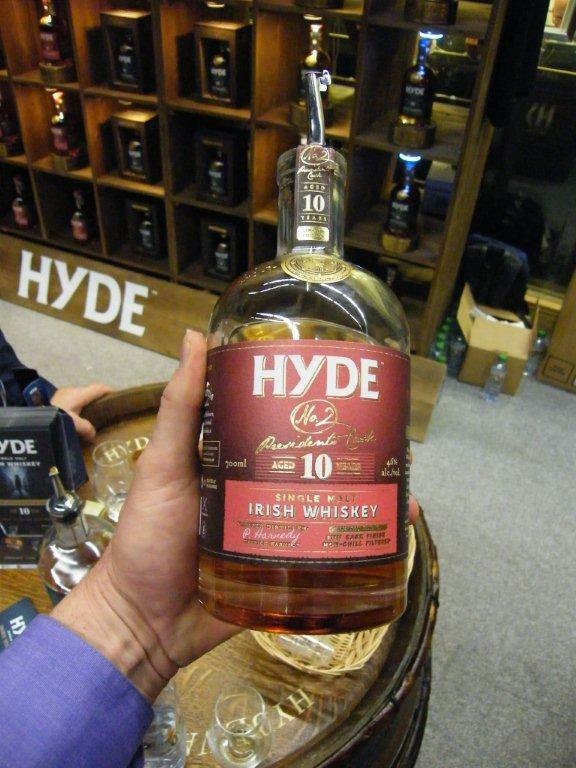 I had a clear winner in the blends under 60 – Hyde No. 6 Special Reserve. Now I know there has been a bit of controversy with this brand as to whether they are simply bottlers or a distillery – but they currently source their spirit from a third party and from my experience in trying out a few of their expressions – they do a good job in finishing the product. There were a further 7 expressions up to 2 points behind this top scorer & interestingly for me – all of them were from new entrants into the Irish whiskey scene. Whether they be actual distilleries or bottlers, the careful selection of casks to mature the whiskey in combined with skilled blending clearly appealed to my tastes. Obviously my tastes are a little bit leftfield as the actual winner on the night – Jameson Black Barrel – didn’t grab me. Confession No 3. I just didn’t have the capacity for anymore whiskey! Again I picked out the next generation of Irish whiskey entrants and was not in line with the winner on the night – although JJ Corry did get a Gold Award. The second judging session found me in better form. I had a meal during the tasting which meant I had the capacity to re-appraise any tie situation – which happened to occur in the first Irish Single Grain category. My eventual winner in this enlarged field over previous years was Hyde 1916 Single Grain. I’m not surprised by this choice – this whiskey grabbed me on first tasting it soon after it was released. 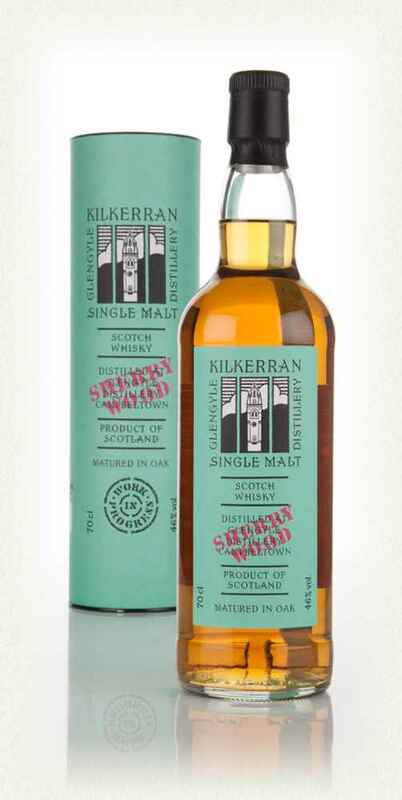 The whiskey that just missed out happened to be the recently re-recipied Kilbeggan Single Grain. And it goes without saying I didn’t pick the actual winner – Glendalough Triple Barrel. Now the 14 entrants into the Irish Single Pot Still category represent to many the creme de la creme of Irish distilling. Midleton distillery dominates this field with their Redbreast, Powers, Spots & Midleton releases. So what did I pick as my winner? Dingle Single Pot Still. The only non Midleton product in the field – & I pick it out. My only tasting notes are a brief ‘different’. 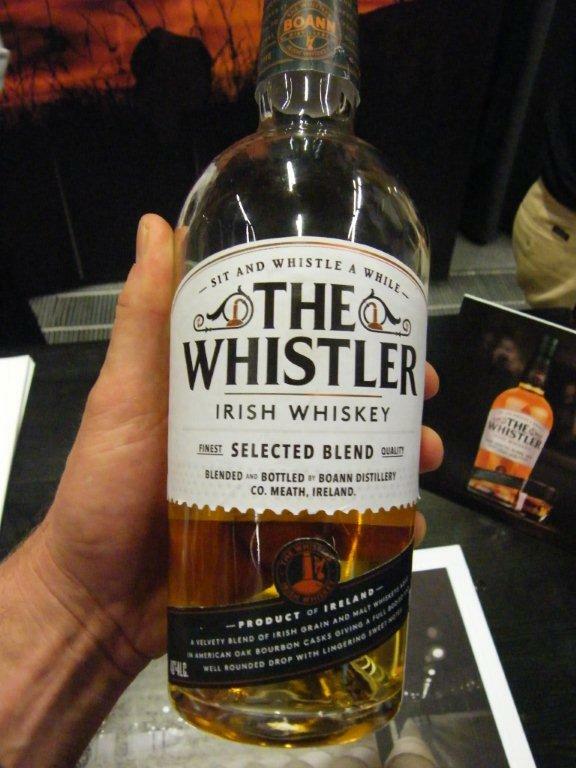 And that to me is the excitement of what the new Irish whiskey companies are bringing to the market – difference. Having said that – this was also a tied category which required a head-to-head duel. The one that just missed out happened to be the Midleton Dair Ghaelach Bluebell Forest release. Now that’s another whiskey showing something different by being matured in Irish Oak barrels. So would the final Cask Strength category give me a full house of winners from the new breed of up and coming Irish whiskey companies? 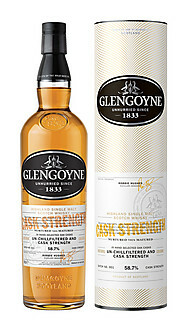 Now this release is also a single cask – but I don’t know which one I tasted. It’s also a sourced whiskey for John Teeling’s new venture in Dundalk – the Great Northern Distillery – whilst his own new make spirit matures. I may not be able to pick out the actual winners on the evening. But I have an uncanny knack of picking out what’s new & exciting in the Irish whiskey scene! Interestingly all of my winners are non chill filtered, all produced for or by new Irish whiskey companies and as far as I can ascertain – none have added caramel. In a blind tasting situation all you are going on is ultimately the taste. I believe I tasted the future of Irish Whiskey. My thanks to all the staff at the Celtic Whiskey Shop for organising the judging sessions as well as the Awards night itself. My thanks also to all the entrants who gave freely of their whiskey for the judging. We all do it these days. For a whiskey fan like myself – the journey begins even before you’ve boarded the plane. The last time I flew out of Dublin I took full advantage of the promotional stalls and tasted over half a dozen Irish whiskey samples – most of which I’d never tried before. The one that stood out for me happened to be Teeling’s Spirit Of Dublin Poitin. 1) This is the first spirit to be released from a new Dublin whiskey distillery for over a century. That in itself makes this recently released poitin worthy of a punt – which is exactly what I did. But on tasting the spirit – I got a lovely surprise. 2) Spirit Of Dublin is a single pot still Poitin. Once I worked my way through that initial oily, slightly rotten fruit smell of new make whiskey – I experienced a very welcome single pot still signature spice warming up my palate and making me smile. Made with a mix of malted barley and unmalted barley – this is a uniquely Irish style originating from an early tax avoidance scheme where unmalted barely attracted no duty. The unexpected result is a fabulous soft spice together with a slightly richer mouthfeel on tasting – which Spirit Of Dublin clearly possesses. If it taste this good straight from the stills – what will it be like straight from the barrel after it’s matured for long enough to be called a whiskey? Perhaps I’ll have to book another flight a few years hence to find out! It’s that time of year when the great and good of the Irish whiskey world gather together in a celebration of distillation. This years event takes place in Tullamore with a visit to the new Tullamore Distillery and an awards evening in the Old Bonded Warehouse on October 20th. As part of the process to pick the winners – members of the Celtic Whiskey Club and the Irish Whiskey Society were invited to a blind tasting of the competing expressions. I made my way up to Dublin for the day to add my scores to the collective pot and found myself in a basement hotel room carefully laid out with 38 identical whiskey bottles – along with a half dozen barrel aged beers – to rate. Irish Blends up to 60. The only way of differentiating them was the bottle code for scoring, the colour and the very subjective taste preferences of the judges. All entrants have to be commercially available in Ireland in October. Other than providing the required sample bottles to The Celtic Whiskey Shop by the allocated date there is no entry fee and ticket sales for the evening are forwarded to charity. I started with the entry level blends. What struck me straight away was the uniformity of colour on display.This saddened me. The variety and differences in blended whiskey are what excite me – both visually and taste wise – yet presented here to all intensive purposes were 15 bottles of identical dark golden brown liquid. My fears of added caramel were confirmed as in one expression after another the dominant – and at times overwhelming – note encountered was sweet. My poor scores reflected this disappointment. A few did have some pleasant fruit notes coming through together with a welcome spice. Some were rough – most were smooth – but there wasn’t much that excited me. I expected a noticeable increase in flavour and quality in the blends above 60 category as experienced last year. Despite the average scores being slightly higher at 66 as to the former’s 63, that all important “more bang for your bucks” wasn’t forthcoming. At least the colour variation was more pronounced. Oh dear! Perhaps my 3 weeks in Australia tasting some knockout single malts, ryes, bourbons and wheat whiskies had jaded my palate. I moved onto the barrel aged beers. Now I must admit to a benchmark brew in this style which all others are judged on. Trouble is – it’s not Irish! There was one dark beer that came out close however. 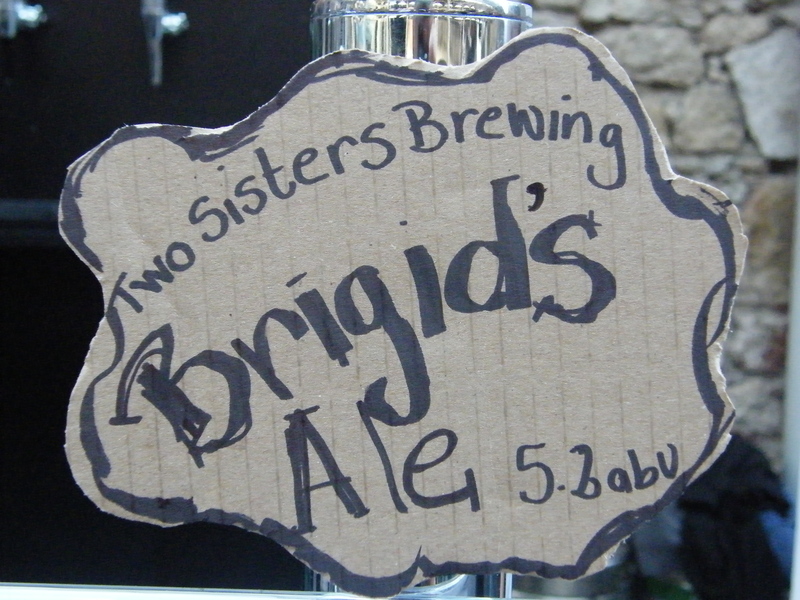 It had a noticeable whiskey nose together with less carbonation giving it a more heavy feel – much to my liking. I should point out my method here. Out of an average 3ml sample I possibly tasted and swallowed half. The other half ended up in the spittoon after having been swirled round the mouth for further evaluation. In between each sample a full measure of water was consumed to cleanse the palate and rinse the glass. I must have drank about 2 litres of uisce during the process. A hearty lunch and some hot tea also split the session in two and aided to my relative sobriety at the end of the day. It was after that lunch I attempted la creme de la creme of Irish whiskey – the Single Pot Stills. Using a combination of malted barley and unmalted barley in the mash, I was looking for – and happily found – the signature soft spice together with some rich fruity notes. The variety was much more pronounced in terms of colour, flavour profile as well as strength. I distinctly thought one entrant was simply a watered down version of another! The average scores rose to 73 for the packed field of 13 entrants. 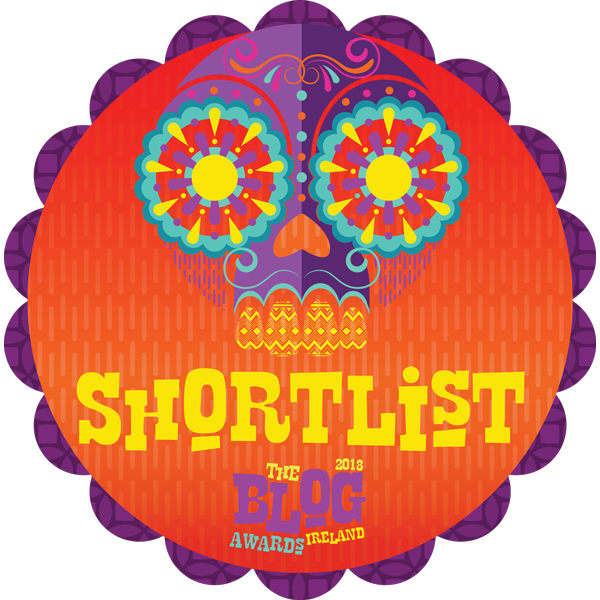 Only in the big reveal on awards night will all my hunches be either confirmed – or more likely dashed. The new Redbreast Lustau release was rumoured to be in the mix somewhere. Was it one of my winners? For me however – the best was yet to come. The Single Casks had only 5 entrants. All scored highly with a 77 average and one stood out. Fuller of flavour and richer in style, I dispensed with the spittoon to immerse myself in their beauty. My winning dram on the day happened to be the smokiest entrant and I fear I’m turning into a peathead! A further sample of this expression went down equally delightfully as the first – well – I did have to re-check my initial scores! The craic agus ceol was mighty during the session. Judges came and went but all added their penny’s worth to the growing banter and collective scores. If you haven’t already joined either the Celtic Whiskey Club or Irish Whiskey Society – isn’t it about time you did? The Irish Whiskey Awards 2105 were held at the fabulous new Teeling Whiskey Distillery premises in Newmarket Square, Dublin on the 15th of October. The awards – which are now in their 3rd year – have quickly established themselves as the premier event on the Irish Whiskey scene. Most of the movers and shakers – new entrants and old stalwarts from within the industry – as well as bloggers – imbibers and whiskey fans from all round the world make a beeline for the highly enjoyable evening exploring the best that Irish Whiskey has to offer. Organised by The Celtic Whiskey Shop – the awards choose their winners by a blind tasting panel made up of members from both the Celtic Whiskey Club and the Irish Whiskey Society. Samples can also be packaged abroad for members overseas. As a member of the former Club – I had an opportunity to take part in the judging process – read my blog here – and add my scores – along with about 200 others – to give the final results. Sadly I prevaricated in booking a ticket for the show so they were all sold out before I made my decision to go. 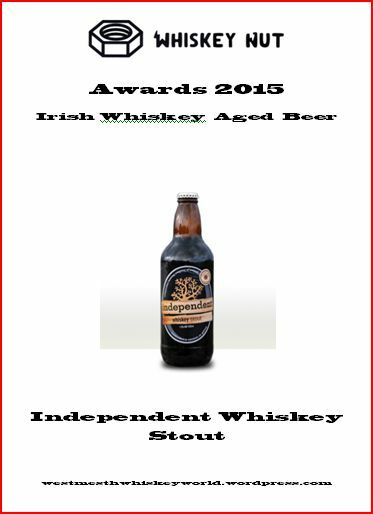 Undeterred – I decided to hold my own Whiskey Nut Awards 2015! Now these awards are based purely on my own preferences and in no way reflect on the prestige of the official awards. As not every category was tasted – my results are somewhat shorter – but they give an insight into my tastes as well as my ability to spot – or not as the case may be – a winning dram. On tasting day there were 13 drinks categories of which 8 pertained to whiskey. I managed to score 5 of these whiskey categories along with a beer one too. My awards are therefore based on the results of those 6 tastings. 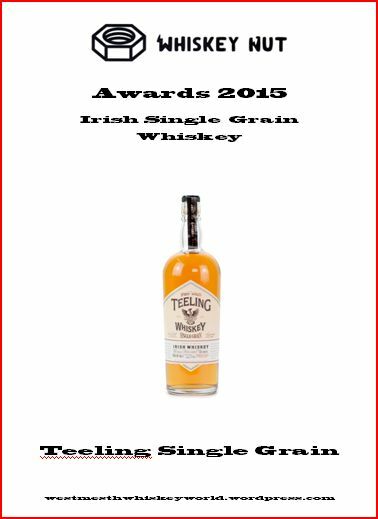 Teeling Single Grain came out a winner with 83 points. There were only 3 entrants into this category and despite being familiar with the drinks I was unable to correctly identify the Teeling Single Grain from the Glendalough Double Barrel which came in only 1 point behind. This result is inline with my preference for an additional finish to the usual bourbon barrel maturation and clearly the use of Californian wine barrel ageing helped Teeling to pip the post. 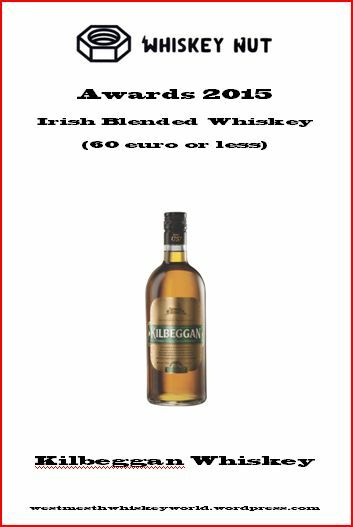 The official winner was Kilbeggan Single Grain. Kilbeggan Irish Whiskey came out tops in this packed field of 15 with 83 points. 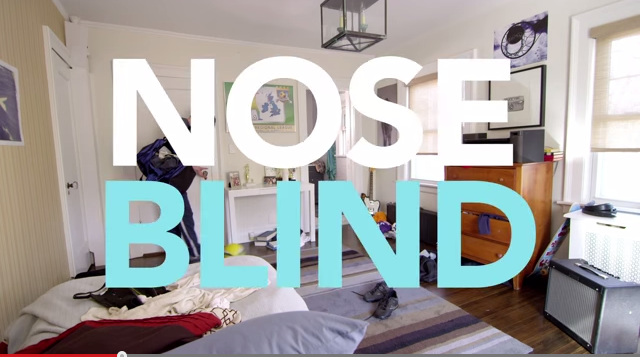 There is an advert doing the rounds just now with a tagline of “Nose blind” . Halfway during this sampling I believe I became “Palate Blind” as I failed to spot the lovely rum finish of Teeling Small Batch nor the spiciness I enjoy in Powers Gold Label and St Patrick’s Oak Aged Irish Whiskey. Despite scoring well – Tullamore Dew Cider Cask also failed to register apple notes with me. Nonetheless Kilbeggan stood out from the crowd. I was a little surprised by this win – but also proud as Kilbeggan is only a half hour away from me! I did revisit this drink after giving it top marks and can only say that it is a deserving winner. I have obviously overlooked this lovely blend in my hunt for new expressions. Ironically it was this blend that ignited my passion for whiskey. A few years ago a bottle was purchased at Dublin airport enroute for a birthday party in France. The Kilbeggan went down very well with the assembled guests who all gave it the thumbs up. So sante to Kilbeggan! 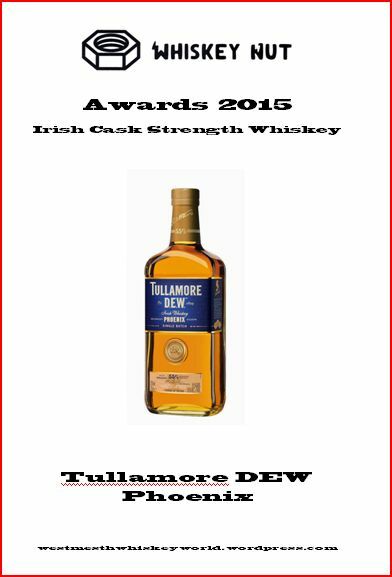 The official winner was Tullamore DEW 12 Year Old which is also a local distillery to me. 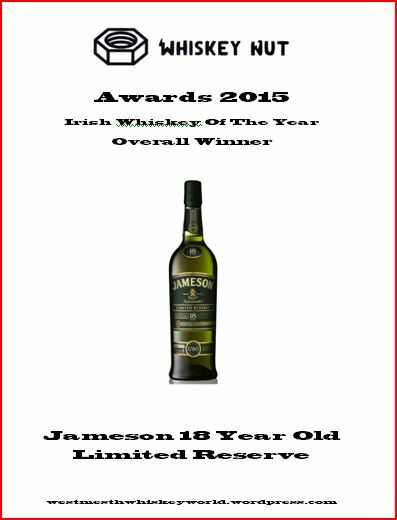 Jameson 18 Year Old came out a clear winner with 92 points. All 5 entrants into this category started their scores level with the winner of the previous tasting reflecting that a bit more money does indeed get you a finer whiskey – at least in this example anyway. My acquaintance with this exquisite dram started at my Jameson Dublin visit and continues here. 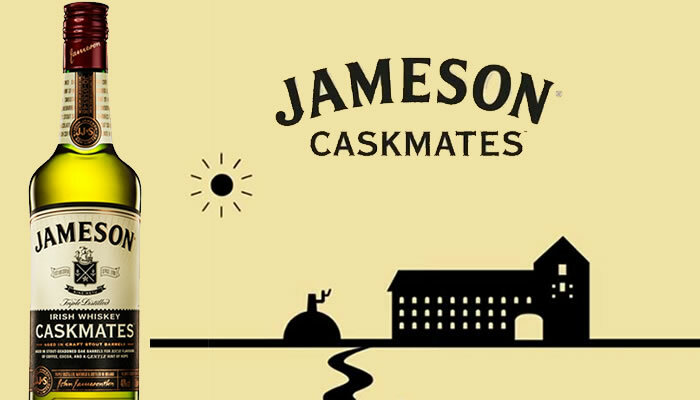 Unlike the beer world – where new entrants are bringing in tastes and flavours far superior to those of the established brewers – Midleton – where Jameson is distilled – continues to show the new whiskey entrants the benchmark they have to attain. A fabulous whiskey indeed! 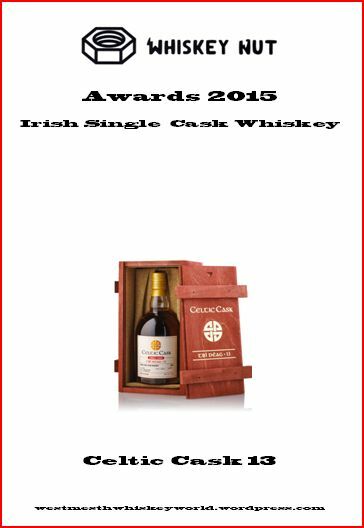 The official winner was Midleton Very Rare 2015. Unlucky for some – this Celtic Cask 13 stood out from a small field of 3 to come home with 83 points. The official winner was An Pucan Teeling Whiskey. Before anyone says I’m biased towards distilleries in my home county of Westmeath and close neighbour Offaly – as in this Tullamore DEW – I will again point out this was a blind tasting! This expression won as it exhibited a bit more spice on the tongue which I like. 87 points. It also was the official winner so I am “on trend” with this category. For years beer was my alcohol of choice. The darker – heavier and stronger the better. Independent Whiskey Stout takes me back to certain ales of my youth. 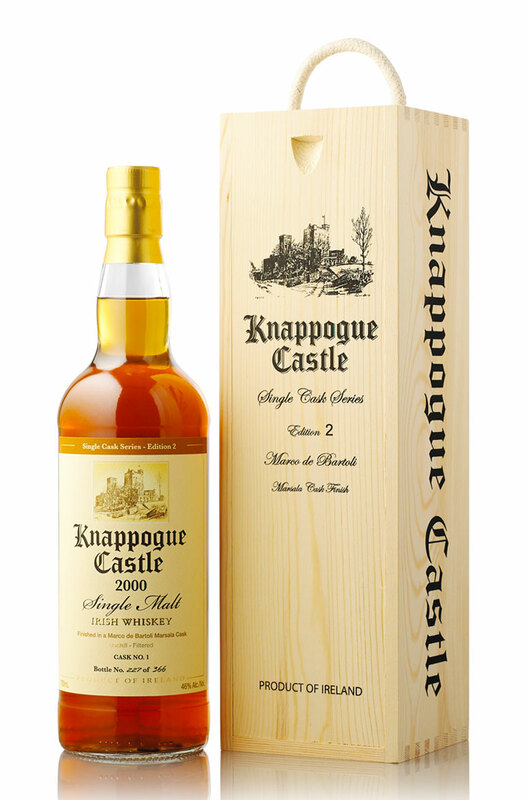 It also gave the best whiff of whiskey both on the nose and palate which helped its way to be a winner with 80 points. The official winner was O’Haras Barrel Aged Stout. Out of a total 63 whiskey samples I managed to score 32 on my judging day. This expression garnished the most points from that reduced field. A comparison can’t be made with the official winner as it didn’t feature in my tasting categories. Many thanks to all at The Celtic Whiskey Shop for organising the awards and a special thanks to all the distilleries who entered their expressions for the blind tasting. My awards – my tastes – my preferences all laid bare. After attending the Dublin show for the first time – I’d certainly recommend any budding whiskey fans to get down to a show wherever you are in the world. The amount of whiskey stands on display – let alone the range of expressions available – and many of the movers and shakers within the industry – are all there to sample – chat and entertain – it’s an event not to be missed. I’d defy anyone to get round all the stands in one of the sessions allocated to guests – so much so that I met a few people who had booked for both the afternoon as well as evening session simply to ensure they visited every exhibitor! After having read Whisky And Wisdom’s excellent blog to surviving a whiskey show – I felt ready to handle what Whiskey Live Dublin had to throw at me. I had a suitable pre-event feed in a nearby cafe. My plan was to walk round the displays without visiting any of them so I could ascertain where the ones I wanted to visit were – as well as seeing if there were any surprises I’d missed on the pre-publicity information. This went well until I rounded the Celtic Whiskey Shop stand where one of the friendly staff that had been at the judging event of last month welcomed me over for a chat and before I could refuse – offered me a taster of a whisky that wasn’t even on my hit list! What else could I do? Now Campbeltown whiskies are renowned for their peat – and as I’m not a massive peat fan I prefer a more balanced approach so the Longrow on offer was gently rebuffed. 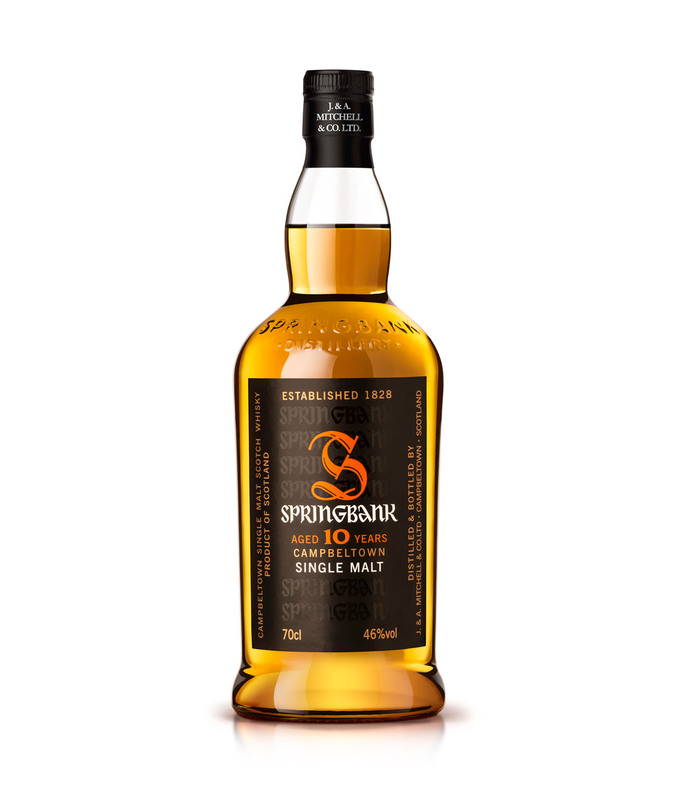 Springbank I’ve tried before and enjoyed – which left the Kilkerran Sherry Wood to duly sniff and slurp. This proved to be a perfectly balanced mildly peated single malt of some distinction. 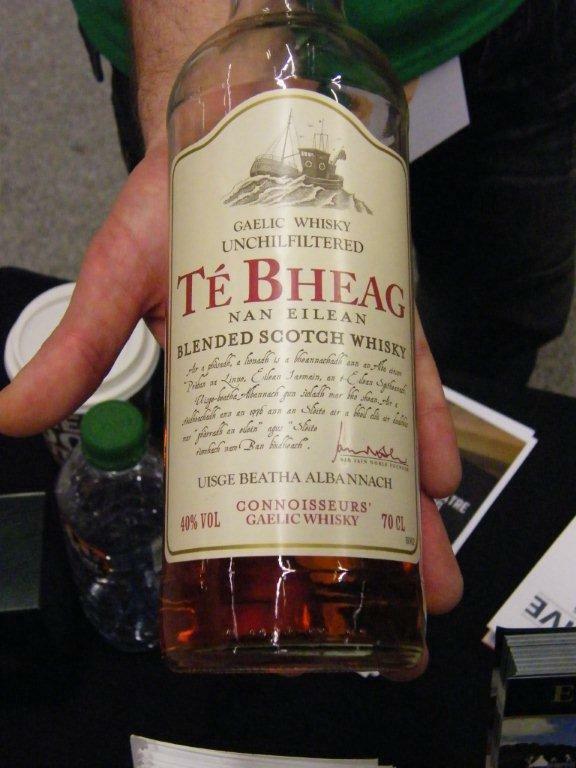 My goodness – if his was an indication of quality of whisky at the show then it was very high indeed. Heading on after gathering more info regards the history of Kilkerran I stumbled upon one of the food pairing stands. L Mulligan Grocers tempted me with a tasty morsel twinned with a smooth Glenmorangie. Lovely. But here I was 2 whiskies down and I’d not even started on my list! Time to get a grip! Oh! What time is it? Time I was in that Powers Masterclass I’d booked for! 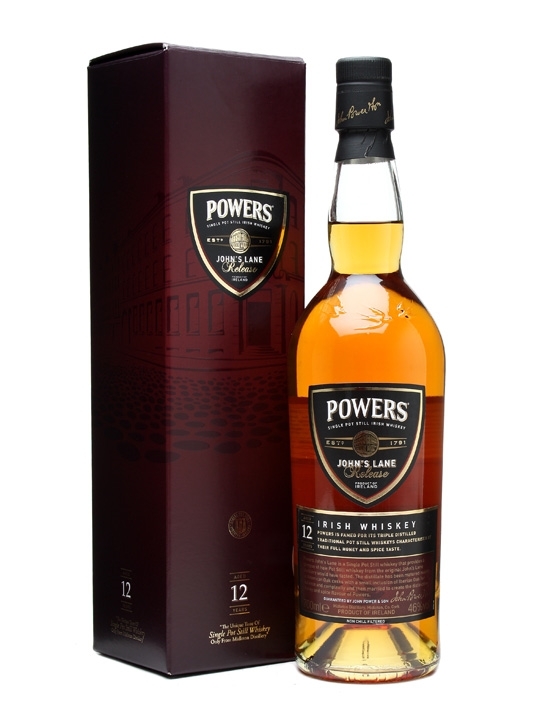 Ger Garland – Ambassador for Powers whiskey – guided us whiskey geeks through a history of Powers whiskey from it’s days in Dublin to the current location in Midleton. This led to a tasting of the 3 single pot still releases available under the newly repackaged Powers label namely – Three Swallow – Signature and John’s Lane releases.Sitting there being guided through the taste profiles of these fine whiskeys by Ger whilst gazing across to Dublin Castle outside the room certainly mellowed my initial rush so that I savoured the nuances of the expressions. Suitably refocused I emerged from the masterclass to head for one of the new Irish distilleries opening up in Drogheda. Boann Distillery’s stills are enroute from Italy as I write this. I assumed they would be from Frilli but no – they hail from Green Engineering – a new name for me.Regardless of who manufactured the stills – as a taster of things to come they have The Whistler. A rather unusual named blend from Boann but distilled elsewhere – this rather rich and heavy blend pleased me very much and I certainly wish all at Boann well with their venture. I for one will be eager to visit the combined distillery – brewery – eatery and visitors centre when it opens! Mossfield Organic Cheese had a stall closeby and being a fan of their Slieve Bloom Cheddar I Paid them a visit to be rewarded by a sample of their tasty cheese paired with an equally tasty Machrie Moor Single Malt from the lovely Arran Distillery in Scotland. Echlinville Distillery on the Ards Peninsula are currently laying down their own spirit for maturation and I was lucky to get a taster of a 2 yo new fill cask which despite it’s youth had some lovely flavours which will only grow with further ageing. 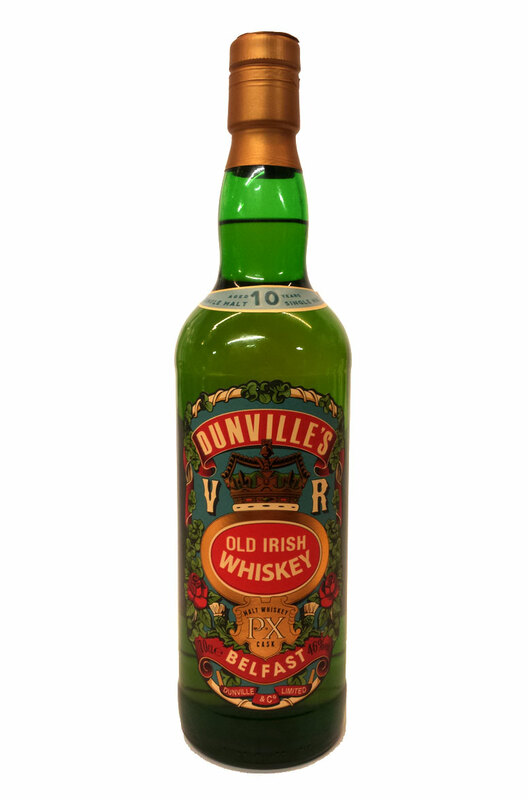 Graeme Millar proved to be a very passionate distiller and ambassador for Echlinville as he guided me through the lovely award winning Dunville’s PX 10 yo Single malt – the surprisingly good Feckin Irish Whiskey blend and the unusual Feckin Spiced liqueur. I certainly think this is a distillery to look out for in the future given that passion combined with great tasting expressions! Now the Hyde 10 yo single malt Oloroso release I bought when it first came out and I have to admit – it didn’t light my fire – unlike The Doors track – but I was intrigued to taste their No. 2 release finished in Rum casks. I mentioned this to the rep and he proffered me a sample of both the releases. The first remained exactly as how I remembered it – lacking something – but the second made up for that with a healthy rum aroma and taste which to my mind gives the spirit a fuller – richer body with a more rounded – mellow – if sweeter taste. Much more to my liking! Perhaps I should have saved my cash for this expression! Now I was on a roll! 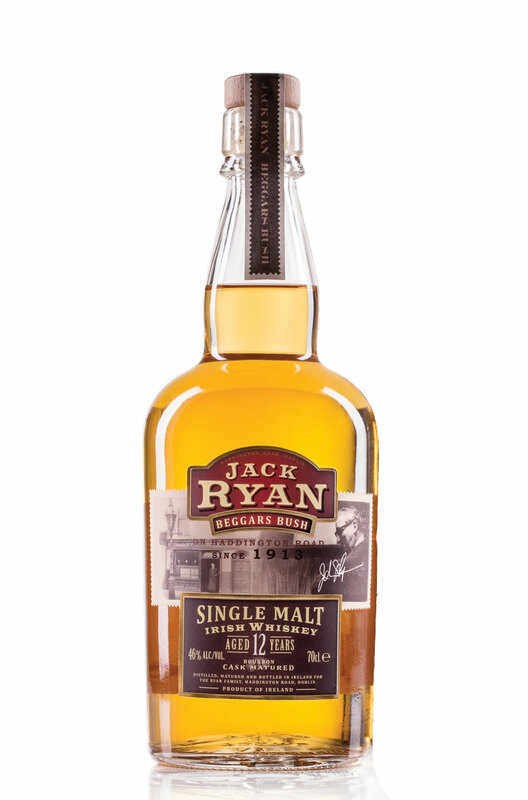 I stopped at Jack Ryan’s stand for a brief chat to congratulate him on his excellent whiskey then moved over to The Palace Bar who also have a whiskey available at their premises – much like how all pubs would do in times gone by. The sample I had was simply – there is no other way to describe it – gorgeous! John Teeling was engaged by a small crowd at his Great Northern Distillery stand so I got talking to a very informed engineer who had helped design and install all the pipework at the Dundalk plant. There were samples of clear white new spirit to try but at 80% proof and above I decided to let it mature a bit more before I’ll give it a go – at least for another 3 years! Dingle Distillery will shortly be releasing their first whiskey expression. Exclusivity is the buzzword here. If you want a bottle – give them your details. They contact you and offer you a bottle from the first cask for 350 euro. They also offer personalised barrel options too. I think I’ll have to wait a bit before I can get a taster of this expression. 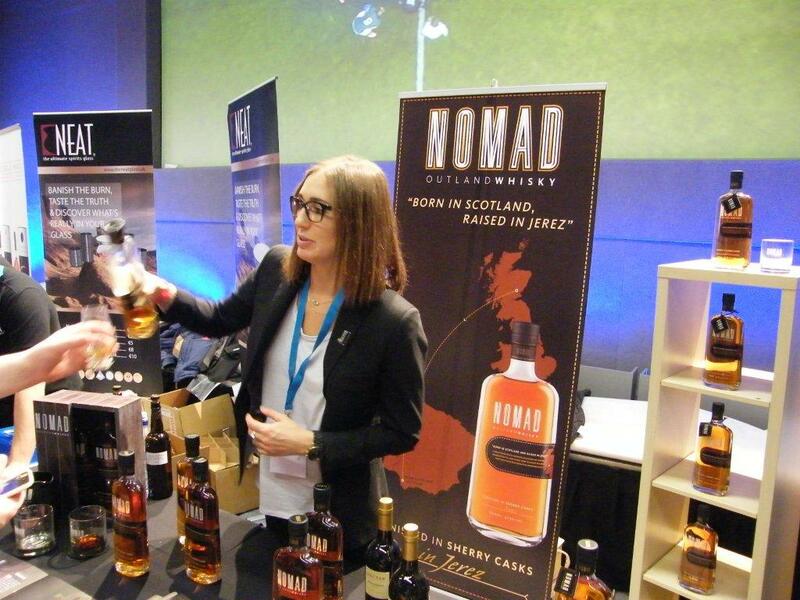 Nomad however were freely dispensing their lovey sherry cask finished blend created by the collaborative efforts of Richard Patterson and Gonzales Byass. It’s distilled in Scotland then shipped to Jerez for ageing so falls to be called a Scotch by the rules of definition.Breaking the rules never tasted so good in my book! As the afternoon session was coming close to it’s finale – I tried Makers Mark from the Beam/Suntory range as I’d been informed this was a classic bourbon. Having yet to develop a taste for bourbon I thought I’d give this one a go. Sadly it didn’t do much for me. A quick venison hot pot from Koh with another Dunville’s PX were my penultimate tasty pairing followed by an amiable chat with the Gaelic Whisky crew over the teaching methods of both Scotland and Ireland’s native language – led me to a taster of their rather fine Te Bheag blend. I have a soft spot for Skye – where this tasty dram comes from – having cycled across the island back in the late 90’s. My grandfather also earned his living in a boat not dis-similar to the one used as a logo by the distillery. So sampling this fine blend and chatting to the lovely people behind it only warmed my affections even more. What a lovely way to end my day at Whiskey Live Dublin. Congratulations to Al Higgins and all the staff at the Celtic Whiskey Shop for arranging – promoting and organising this wonderful event. I’ll definitely be back next year! Oh – I managed to get the train home OK and even bought my cup of tea with a snack before boarding to ensure I arrived home in a fit state – not parched dry like my last visit to Dublin! It’s A Dirty Job But Someone’s Gotta Do It! Who would have thought that an invitation to taste – sample and rate some of the best whiskeys that Ireland has to offer for the Irish Whiskey Awards 2015 ceremony to be held on October 15th in Dublin could end up being such an arduous task? As Faith No More sang – We Care A Lot. I maybe should have taken a leaf out of former President Clinton’s advice when it came to hard drugs – “I didn’t inhale”. Well I sniffed whiskey and swallowed. Pretty dam good it was too – but after about a 30 sample score for the day – it had the potential to be messy – which thankfully it wasn’t. I would however recommend – both for my future health as well as anyone else who cares to indulge in these events – the correct use of the spittoon. Sniff – Slurp – Swirl – Spit – Score. For an informative and entertaining blog on attending whiskey events click here. The particular event I attended was hosted by the Celtic Whiskey Shop who advised on the scoring method to be used. 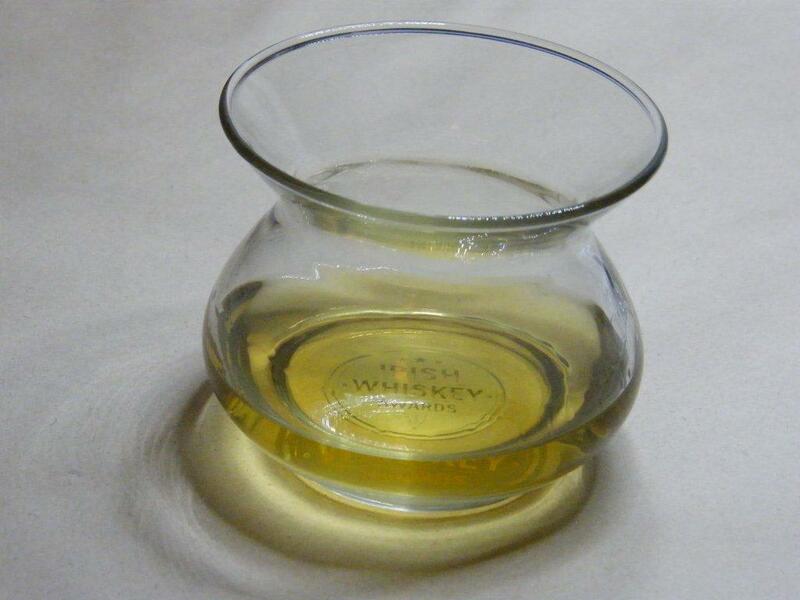 Sniff the whiskey – score out of 25 for aroma..
Slurp the whiskey – swirl round the mouth for taste – score out of 25. Spit the whiskey out into the spittoon – score out of 25 for the finish. Finally give another score out of 25 for overall impressions and balance. Giving a total score out of 100 for each whiskey tasted. I’m a bit apprehensive about scoring my whiskeys as such. I find tasting such a subjective and personal experience rather than the objective and clinical approach that judging should be. It takes a lot of the whiskey tasting fun out of the equation – but nonetheless I was here to judge so that is what I did – and it soon became fun too! For the sake of uniformity all judges were given a NEAT glass each with which to sample the whiskeys. Now I’ve not encountered this glass before – I tend to use a smaller version of the classic tulip shaped Glencairn glass – whereas the NEAT has a more flat thistle shape to it – handy for printing a logo on the bottom? – NEAT claim it enhances the aromas as well as delivering a controlled sample across the tongue – I’d agree with the latter but uncertain on the former. I should also say that all the whiskeys were sampled blind. They were presented in identical clear bottles with only the colour variation to differentiate them before tasting and an alphabetical/numerical code to match the score sheet. My first category to try was the Irish Single Grains. As there were only 3 competitors in this field it probably isn’t difficult to guess which expressions they are. My scores reflected my previous encounters with these lovely smooth whiskeys and only a point separated the top two – but are my tastebuds up to guessing which particular expressions they were? All will be revealed on awards night! 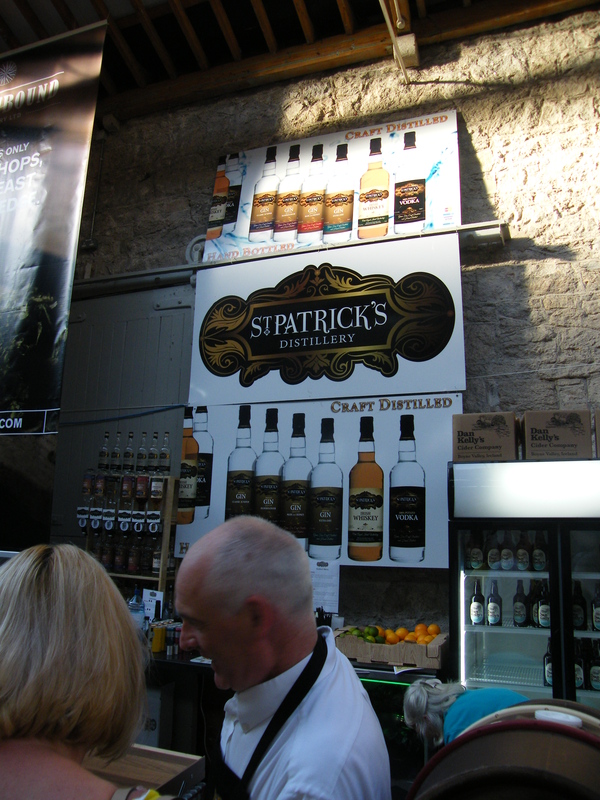 My downfall occurred during the very large Irish Blended Whiskey under 60 euro with 17 entrants. I started here as it’s probably the most likely category I’ll buy regularly. To begin with I eschewed the spittoon wishing to sample as many fine whiskeys as possible. It quickly became apparent that not all the blends were actually fine – some were – some weren’t – and I’d end up exceedingly drunk if I swallowed the whole taster. So never before have I thrown away so much whiskey. I should have brought along an empty bottle to decant the remains into – but I didn’t – and by the time I thought of it I was mildly intoxicated and couldn’t be bothered. Anyway I soldiered on. My scores ranged from a poorly 64 up to a nice 83 with most being in the 70’s bracket which I would call grand – in the Irish meaning way. I can’t wait to find out who I gave my top mark to! A hearty lunch was called for to soak up the alcohol together with a large glass of water. I ventured forth into Dublin city centre which was basking in the brilliant sunshine that had eluded Ireland all summer. Pity I was sequestered in a hotel basement tasting whiskey – hence the title of this blog! Suitably refreshed I returned for more categories. The 3 entrant slate for the Irish Whiskey Barrel Aged Beer lot started the afternoon proceedings gently followed by Irish Single Casks again with 3 offerings and then the Irish Blends over 60 euro. There were also a few more judges about and discussion soon started comparing our experiences. I was reassured when 2 other judges also chose the same top scorer as myself for the Single Casks and in an interesting turnaround – my top scores were another judge’s bottom scores across 3 separate categories! At least there was consistency in our differing tastes and remarkably – our ratio of top to bottom scoring was also consistent! Perhaps there is something in an objective approach to scoring whiskey! I do think it has to be blind though as seeing the expression comes loaded with a whole set of previous assumptions and experiences of the brand. Time was marching on however and aware I had a train to catch I resisted the large Irish Single Pot Stills category to go for another small field in the Irish Cask Strength Whiskeys. Now I know I’ve expressed difficulty with cask strength before – how much or how little water to put in – but I had been encouraged by others that the entrants were very palatable and showed off their colours when tasted neat and I must state -neat, neat, neat is how I like my whiskey – cue another video. Indeed loud music was how I was feeling with so much fine whiskey consummed – but after a dash for the train all I had on offer was my trusty ipod and some repetitive dance tracks to accompany my journey west. I felt devastated finding out there was no trolley service to quench my whiskey buzz. 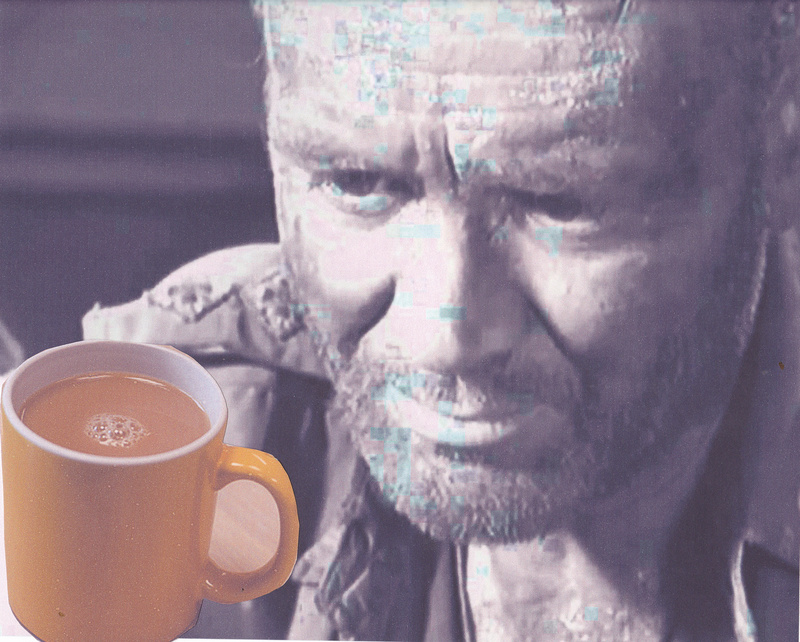 By the time I got home it was like the famous scene from Ice Cold In Alex – except it was the tea I was after! So there you go. A day out judging Irish Whiskey. I’ll have to wait for the big event on the 15th October to find out not only which expressions I tasted – but which ones came out top in their class. 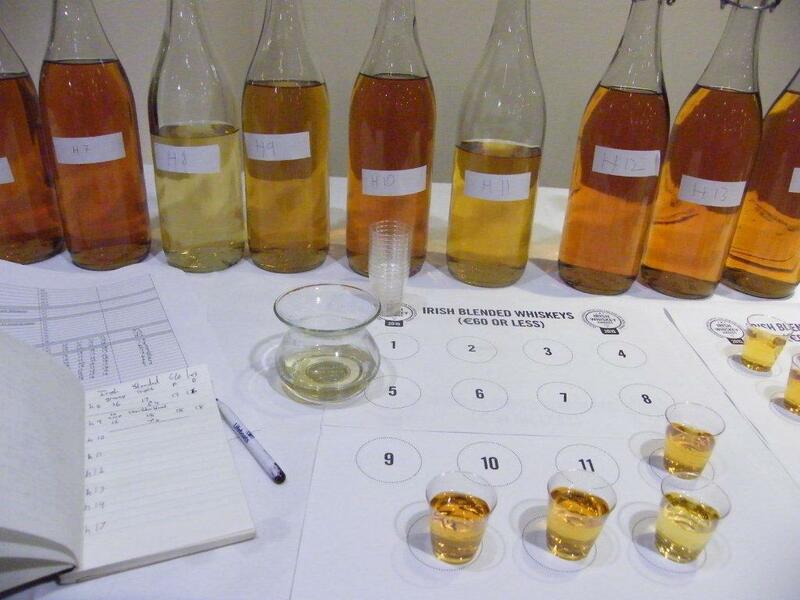 Not only will it be a great showcase for the best in Irish distilling – but a test of my judging abilities. I’m excited at the prospect!